A big thank you to Appelboom for sending this over for review! I saw him post a picture on Instagram and the very next day, there was one at my door. Diameter (section): 9.0 - 9.9 mm/0.35" - 0.38"
I admit I am not the biggest fan of Pelikan's standard gift boxes. They do the job, but never feel inspired or fun. I also never use them. That is (somewhat) changed here! 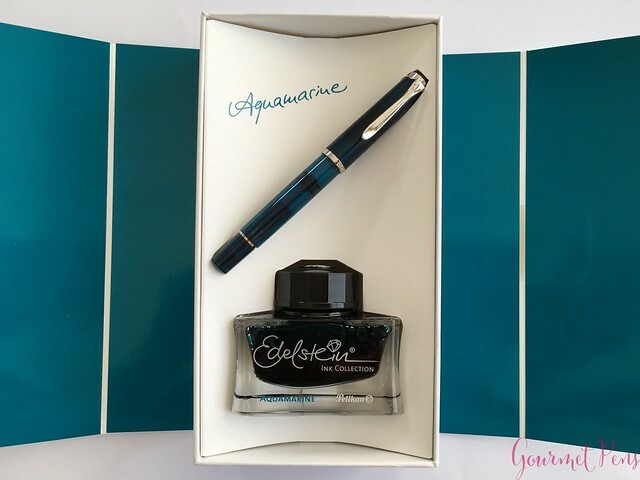 The Aquamarine pen here comes in a small gift set - a solid, plastic coated two flap gift box hugs the box in the middle. 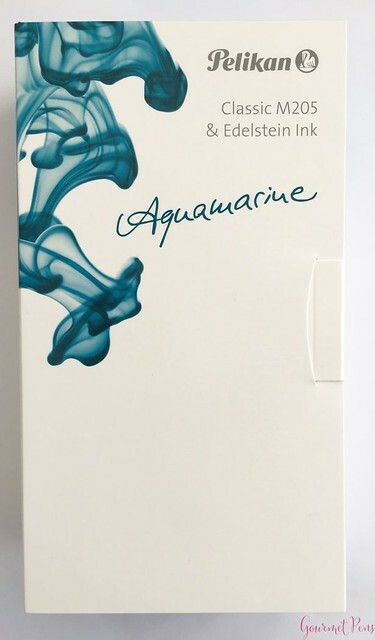 The outside is white with aquamarine colored ink swirls, and the front has the following print: Pelikan Classic M205 & Edelstein Ink - Aquamarine. 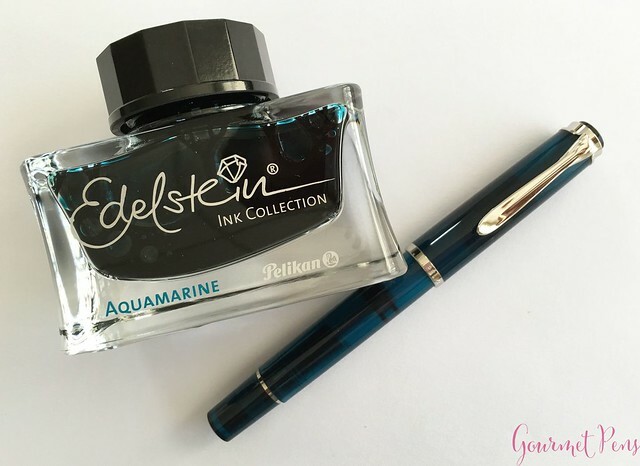 The box on the inside holds the pen and a matching bottle of the Pelikan Edelstein Aquamarine ink of the year from 2016. It feels more like a special edition with packaging that is made just for the pen and ink combination. Probably not something that is worth keeping, but it's nice presentation and is more fun than the standard box. The M205 model is on the smaller side when you compare it to the rest of the Souverän series. It is larger than the M300, the same size as the M400, and smaller than the 600/800/1000. It shares the shape and design of the Souverän series, but has a simpler look. This Classic M205 is a round pen with slightly rounded off ends. The finial is a silver-on-black modern Pelikan logo. The silver colored clip is attached externally, and like the Souverän series, it is shaped like a pelican's bill. The center band is at the end of the cap. 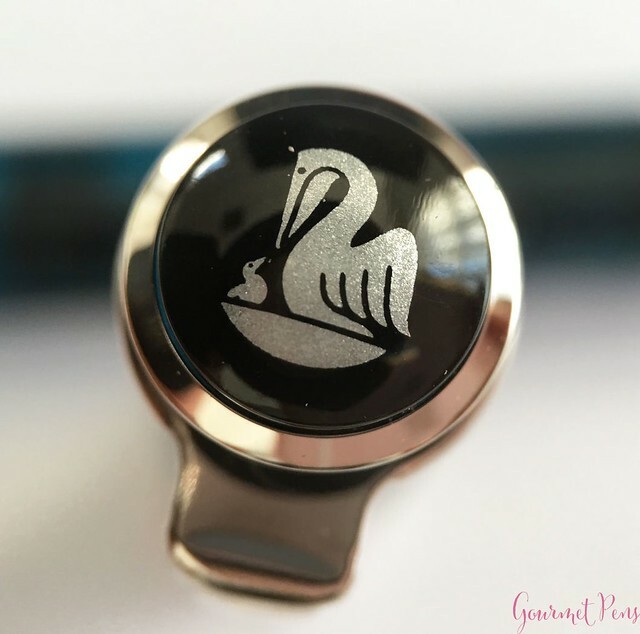 It is a thin, silver colored band, engraved with Pelikan Germany. The section is fairly small, with a pinched shape. 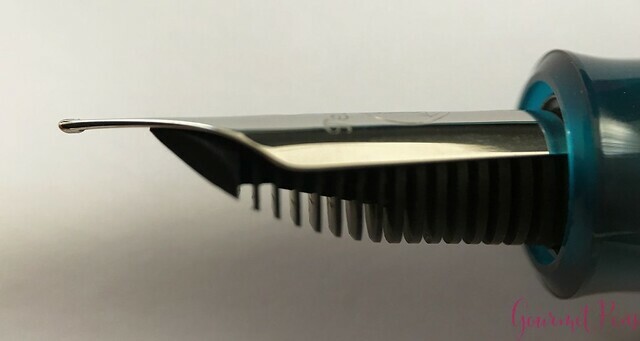 It flares out into a ridge before the nib. The fun part about this pen is, of course, the color! 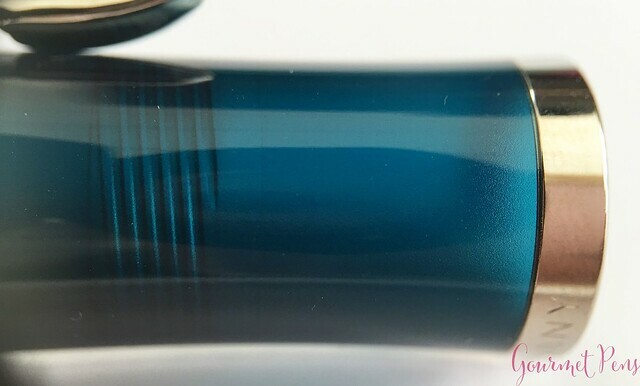 The cap, barrel, section, and piston-turning knob are a medium dark, frosted aquamarine color. The frosty look matches that of last year's Classic M205 Amethyst - it is sort of cloudy, not clear and completely polished. 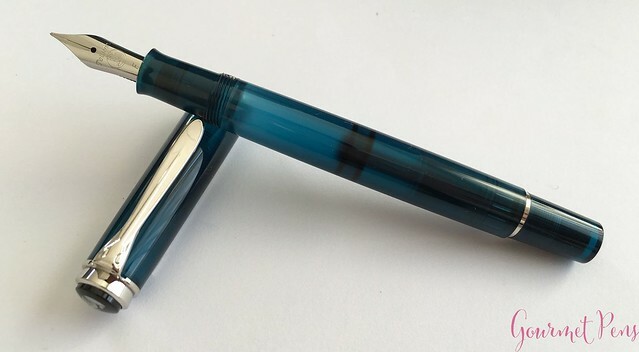 If you are looking for a truly clear blue-green pen, this frosted color will likely disappoint you. 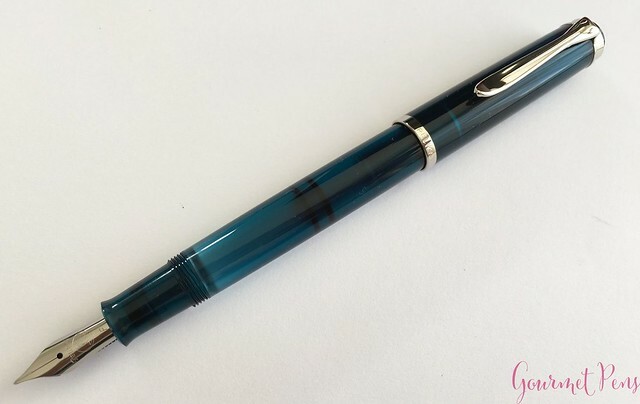 The deep blue green color is complemented by the bright, polished, silver colored trim, and matching polished steel nib. The nib is a fine stainless steel nib. 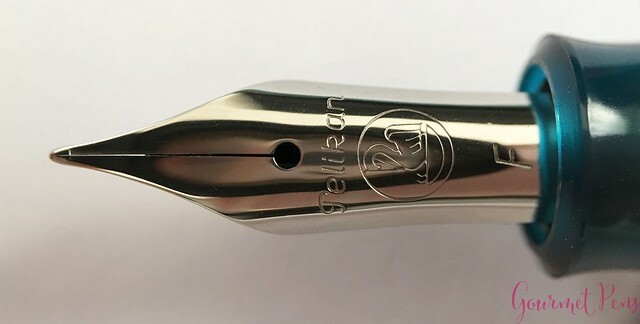 It has a single slit and a round breather hole and it is engraved with Pelikan, the Pelikan logo, and the nib size (F). 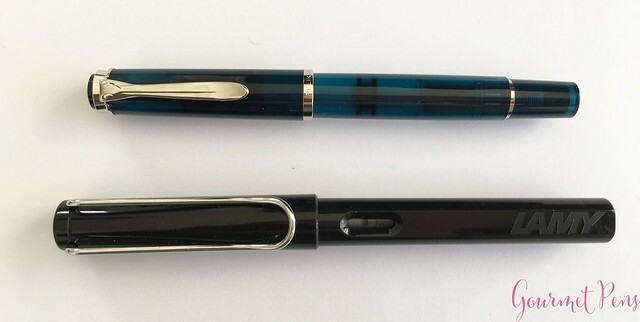 I like the nib design - it is clean, and looks attractive. The nib is also very shiny, so it looks extra pretty! 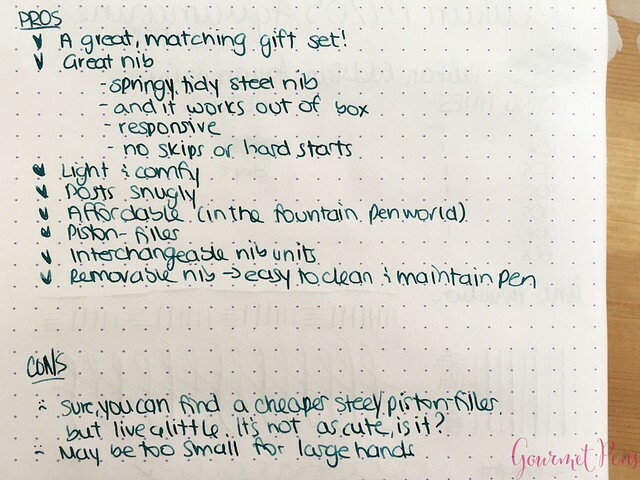 My experiences with the M2XX series of steel nibs has always been very positive, and this one is no different. The fine nib has a bit of feedback, but it is a well polished, well tuned nib. It is not scratchy, and of course, the feedback is a result of it being a fine. It is a fairly wet nib, with average to fast drying times, and great line variation. The nib does not skip or hard start, and it handles fast writing and long writing sessions with ease. With normal writing, you get a Western fine - not super fine and on the wet side. 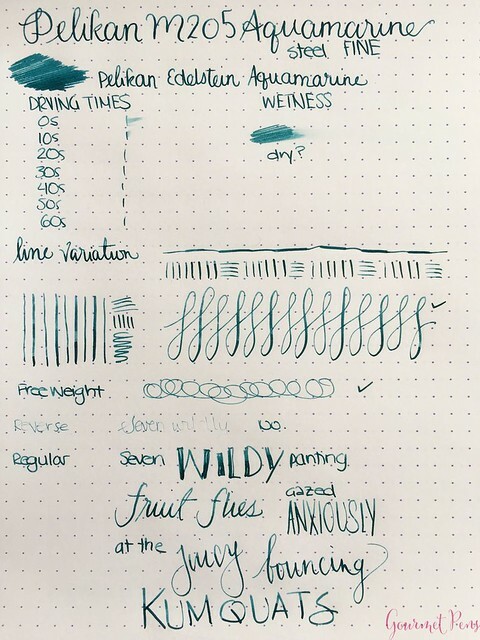 With some pressure, the nib goes from a fine to broad, and ink flow keeps up surprisingly well. It is truly a lovely nib, and it makes for an excellent starter nib, or a workhorse daily carry pen. As I said with the Classic M205 Amethyst, which had a solid performance with its fine nib, it is a great every day user. The clip was nice and springy - it was easy to operate one-handed. The pen was also lightweight enough that the clip could handle the weight of the pen. The section, although small, was comfortable with its pinched shape. The lip at the end helped keep my grip in place. I did not find it slippery at all, nor did I find the threads at the end sharp or uncomfortable. I like the size and shape of the section and the pen in my hand. Unposted, the pen was lightweight and comfortable. It is on the smaller side, but was well-balanced in hand. The cap posted by friction, seating deeply and securely. Posted, the pen was still well-balanced and comfortable, and the added length made the pen more usable for longer writing sessions. 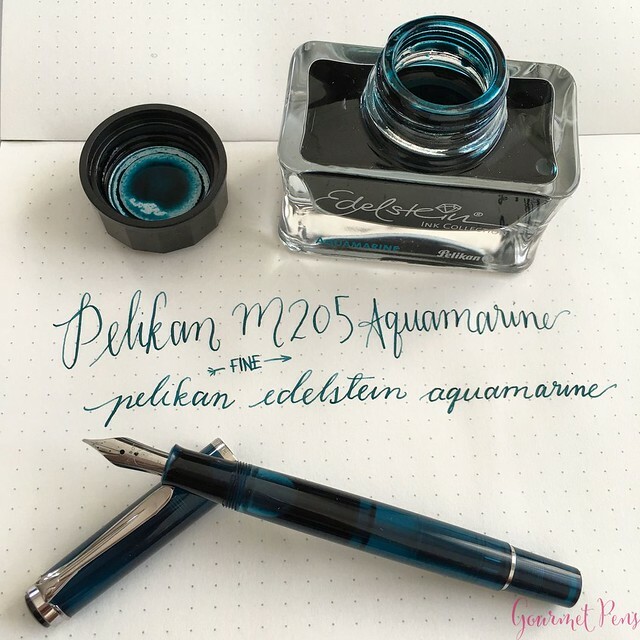 I really love the M2XX series by Pelikan. There have been and still are several colors to choose from, and the nib range is very decent - Extra Fine to Broad. They are usually not too difficult to get, until their production time is up, and the nibs perform well. The nib units are also interchangeable and unscrew without any tools. You can clean and maintain the pen pretty easily at home. I like this Aquamarine color a lot, though I admit I would love to see a clear version of it instead. The gift set is the perfect duo to give to a friend. Of course, you can find a pen with a steel nib for less, and I do think the price tag on this is quite steep. Last year, the M205 Amethyst was € 125, so an extra € 25 for the ink is a bit insane. It's more reasonable when you purchase it without VAT, and it's still overpriced, but maybe less painful. Of course, you could do worse. This pen is also available on its own (without the ink) but I have not seen it on Appelboom's site yet. It's still relatively affordable, and it is quite enjoyable, but whether it's worth the price tag can only be decided by you! I received this item on loan for the purposes of this review. I was not compensated monetarily for my review. Everything you've read here is my own opinion.